The Friends of Wetherby-Pembridge’s mission is to foster a strong sense of community, promote a positive spirit among Wetherby-Pembridge students, parents and faculty, to facilitate effective communication in partnership with the Administration, and to support and promote the vision of the School. The Friends of Wetherby-Pembridge assist with school events and parent engagement with the direction of the Executive Board and event committees. 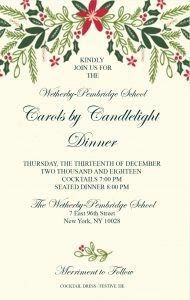 December 13, 2018 – Carols by Candlelight Dinner and Fundraiser: Wetherby-Pembridge parents are invited to attend this beautiful event and support Pediatric Cancer Research at Memorial Sloan Kettering Cancer Center. Please click here to be directed to the donation page.